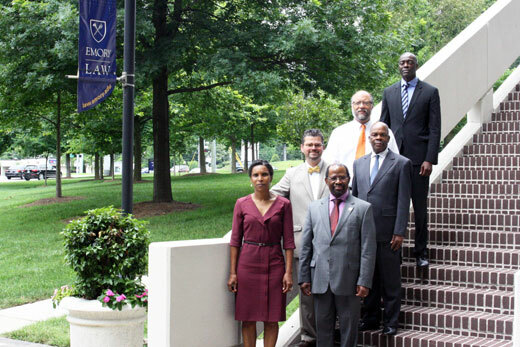 Ideas, frustrations, inspiration and understanding were exchanged when four Supreme Court justices from the Republic of Mozambique visited Emory Law earlier this month. The justices met with adjunct professors Matthew J. McCoyd and Lindsay R. M. Jones, who are judges in the DeKalb County Magistrate Court and associate directors of the Center for Advocacy and Dispute Resolution. The visitors shared details about the structure of their court system and learned about the structure of American courts. The justices had already visited with scholars in Washington, D.C., earlier in the week and received a comprehensive explanation of the way American federal courts work, so McCoyd and Jones provided an in-depth look at how state and local courts operate. On both sides of the table, brows were knitted and hands were tented as translators helped interpret the nuances of legal jargon from Portuguese to English and back again, including when Justice Matilde Monjane De Almeida explained the extensive process required to become a judge in Mozambique. The Emory Law professors who participated in the June 11 meeting said they hope to continue working with the justices from Mozambique. “Meeting with the justices from Mozambique was a wonderful opportunity to learn how their legal system is addressing some of the systemic challenges all legal systems face and builds on the Rule of Law work we have been doing in Mexico, China and Russia," McCoyd said. Added Jones, “I hope and look forward to taking up the justices' invitation to visit them in Mozambique during the coming academic year to explore the establishment of an ongoing comparative judiciary studies initiative."